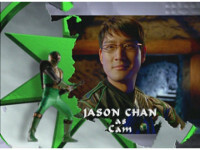 Opening credits scenes, PRNS Opening Credits V2. Pan down a mountainside near the water. Track left near a waterfall. Dissolves in, dissolves out; Alternate take. The camera rises in view of the bustling Wind Ninja Academy. Multiple Wind Ninja Academy cadets spar with each other. Deleted footage; Dissolves in, dissolves out. Choobo opens a box containing a scroll. Tori, Shane, & Dustin bow before Sensei Watanabe. Push in on the three Wind Morphers. Zoom out as Tori, Shane, and Dustin stare seriously forth. The "Power Rangers Ninja Storm" logo comes together in a swirling tunnel of reddish/orange energy. Dustin, Shane, and Tori rip off their clothes, revealing their Ninja Academy uniforms beneath. The air symbol on a red Shoji screen. Shane flips over on his skateboard in slow motion. Shane holds his Morphered wrist up. The water symbol on a blue Shoji screen. Tori walks along the shore with her surfboard under her arm. Tori holds her Morphered wrist up. The earth symbol on a yellow Shoji screen. Dustin bends over backward on his midair motorcycle. Dustin holds his Morphered wrist up and looks at it. The thunder symbol on a purple... err, crimson Shoji screen. Hunter takes his helmet off while on his motorcycle. Push in on Hunter turning his head and smiling. 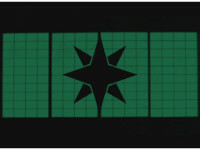 The uhh, other thunder symbol on a navy Shoji screen. Blake takes his helmet off while on his motorcycle. Push in on Blake smiling. The samurai symbol on a green Shoji screen. Cam cheers with a raised fist. Push in on Cam folding his arms and smirking. Sensei Guinea Pig talks with staff in hand. As the Hurricane Megazord glows, all six Ninja Storm Rangers appear before the camera. Yellow kicks a Kelzak in midair on his Tsunami Cycle. Red slashes his glowing sword forth. Crimson & Navy Thunder Rangers ride their Tsunami Cycles away from an explosion. Split screen of Kapri & Marah smirking wickedly. Kapri's side is mostly unseen stuff. Three quick shots, each closer on Lothor, as he marches grimly with his full army of Generals. Tinted differently than in episode; shot 1 is a deleted angle; fades to white. The six Ninja Storm Rangers gesture arms and project their glowing chest symbols forth. Is all one shot in source, with second shot going last, but they cut out a little bit in the middle. An energy bolt reaches up at the three Ninja Glider-riding Wind Rangers. The three Wind Rangers fall in spinning formation from their Gliders. The Winds & Thunders fire their Storm Striker & Thunder Blaster at the same time, the two balls of energy spinning forth. The Wind Rangers rides their Tsunami Cycles out of the Mobile Command Center. Red Tri-Battlized Ranger poses in front of a massive explosion. Hawkzord flies straight at the camera. Tri-Battlizer Armor flies down, hooks up with Red, turning him into the Red Tri-Battlized Ranger in midair. Samurai Star Megazord reverts to Chopper mode. Crimson pilots his Ninja Glider Cycle through a tunnel. All six Rangers have a laugh while watching the viewscreen. Green Samurai Ranger spins his upper helmet around amid flames. Thunderstorm Megazord fires energy from its Lion chest. Samurai Star Megazord poses in midair. Storm Megazord finishes performing its finisher attack. 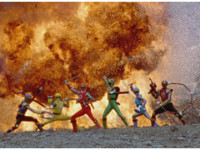 The six Ninja Storm Rangers pose in front of colored smoke, which turns into an explosion. Zoom in suddenly on the "Power Rangers Ninja Storm" logo in the reddish swirl tunnel.